If you purchase a Solid Stage Drive (SSD) of the current generation you usually have access to two features that reduce the wear leveling and write amplification of those drives. The first is called the TRIM feature which is currently only supported by Windows 7 and no other Windows operating system. Trim needs to be supported by the SSD as well which most Solid State Drives of this generation support either out of the box or after a firmware update. TRIM basically allows the operating system to send information about unused data blocks (for instance after deleting files) to the SSD controller which then has a record of blocks that are available for writing. This speeds up write processes of the SSD. The second feature or process is usually referred to as Garbage Collection. This basically optimized the Solid State Drive again for write processes. 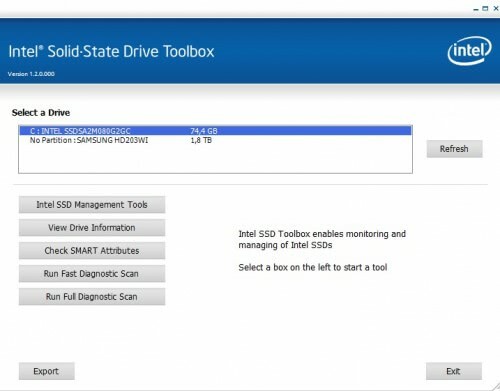 The Intel Solid State Drive Toolbox is a Windows software program that can be used to optimize and analyze Intel SSDs that are installed in the computer system. It supports running regular optimizations that make use of the above concepts to retain the drive's performance over time. It can furthermore be used to view drive information, check the Solid State Drive's SMART attributes and run a fast and full diagnostic scan on the selected drive. The drive information for instance display the drive's firmware version, model and serial number which can be used prior to upgrading the SSD's firmware if a newer version is available on the Intel website. The most important feature is however the SSD optimizer which computer users need to run regularly (Intel recommends once a week) to retain the drive's performance. The weekly runs can be scheduled in the program which will later be added to the Windows Task Scheduler. Hmm, this won’t connect to my 80gb X25-M 34nm. Error connecting to drive in the drive list. Latest 02HD firmware. Bizarre. 160GB X25-M, most recent firmware, all drives (two partitions for the X25-M) show “Error connecting to drive”. Can’t do a thing, everything grayed out. Pity Intel gives so little information on this tool. PS: mine’s a G2R5 (generation 2, release 5, I believe), packed date 21 January, old enough to be supported you’d say. Is the 34nm the second generation, and the 50nm the first? Mine’s the silver-coloured one, I’m fairly sure it’s the newer of the two. I’m just about to try another firmware update, perhaps something weirded out the first one. You can check in the device manager, if it says G2 you got a second generation drive I think. I have. And I’ve got an nForce mobo, which I’m reading is the cause of the problem. Grr. Fixed it. Needed to update my nForce drivers, then switch out the SATA ones manually for the default Windows IDE controllers. All’s fine now! If you run windows7 with the microsoft drivers and have trim working, you do NOT need to use this program. It does basically the same thing that trim does. Have you an official link for that statement? The tool mentions that it optimizes the SSD including trim functionality. Also see the chart at the top of page 5, which spells it out very clearly. Okay, so if the Os is Windows 7 and the storage driver is Microsoft AHCI then you do not need to run the optimizer but you need to run it otherwise. Yep, exactly correct. If trim is working, you don’t need the optimizer. The first prob is, that when owning an older nForce chipset (e.g. 590) and when using the Microsoft AHCI-Driver, the performance of the SSD is measurably worse than with the original driver by NVidia.